To reflect the changing times, today’s marketers are trying to create an additional P to supplement the marketing mix that has been celebrated for decades. Which one truly holds out? With the help of Johnson Direct (JD), RBP Chemical Technology recently launched a web-based tool to support its sales force and provide a higher level of service for its customers. 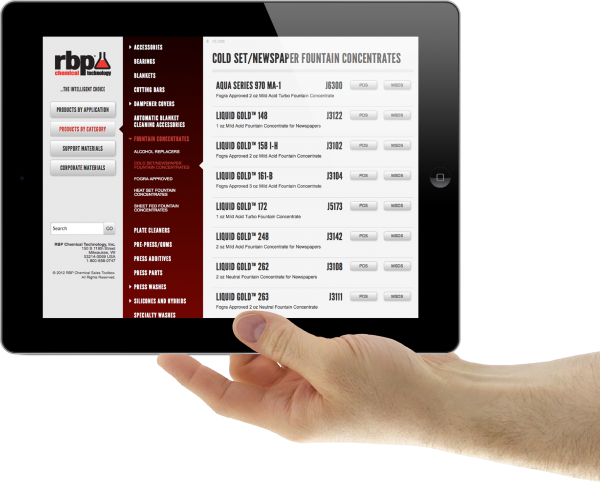 The proprietary, custom-developed product-selector tool, called RBP ToolBox, was created specifically to serve RBP Chemical’s printing and electronics customers online. Designed and built by JD, the online application is available to the general public at www.RBPToolBox.com, however some product data is available only to registered users. Tested in the field by RBP sales personnel and customers, RBPToolBox.com is easily accessible online for users in the office, on the plant floor or on the road whether they are using a tablet, laptop or desktop computer. Find out how its working to improve sales and service for RBP customers. Last week I was fortunate enough to head south to Kentucky and tour several bourbon distilleries with a group of bourbon aficionados. That point is crucial to understand. Most of the individuals (10 in our group) who toured together have a very high “bourbon IQ.” They know how it is made, what the differences in mash bills (recipes) are, what aging in barrels does to the products, etc. We toured six distilleries: Buffalo Trace, Four Roses, Wild Turkey, Jim Beam, Willet and Maker’s Mark. Are you among the marketing execs and CMOs that believe visioning and strategic thinking are most critical to your personal success? If so, you aren’t alone. In a recent survey, 89% of CMOs shared this conviction. The report published by Forrester Research found that when CMOs want to increase their influence across the enterprise, they attribute their personal success in this area to their capacity to think strategically about how to support the business goals of the enterprise — and not just in marketing terms and metrics.